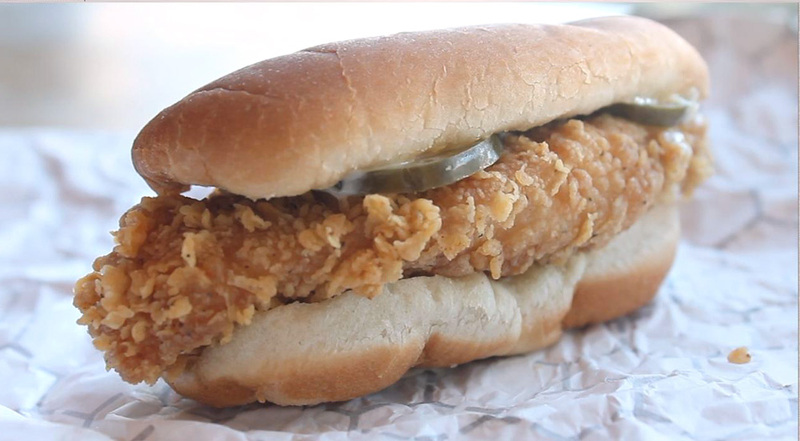 A chicken sandwich for less than a buck-fifty shouldn't taste this good. 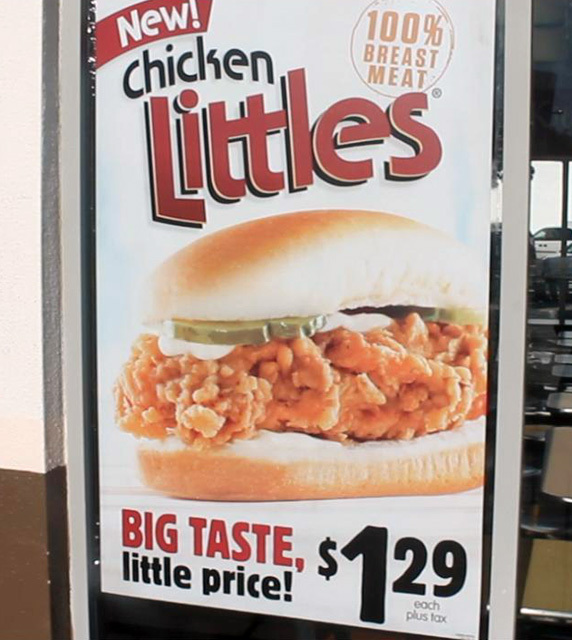 But KFC's Chicken Littles sandwich has a pedigree: it was first introduced over 20 years ago. Honestly I don't remember ever having one, but I suspect it was a larger sandwich. The present day Chicken Littles sandwich is more like a slider -- it's small but still packs a lot of flavor. 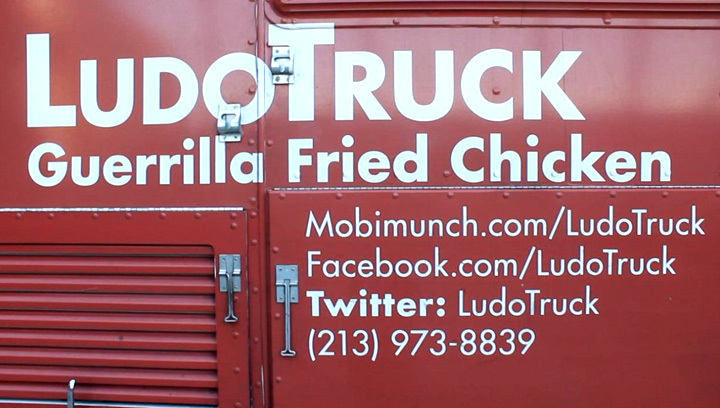 If you were here last week then you saw my video review of Top Chef Master Ludo Lefebvre's fried Chicken Tenders from his Ludo Truck. Not the best bite, but just okay -- I thought Ludo could learn a seasoning lesson from the real masters of fried chicken, KFC. 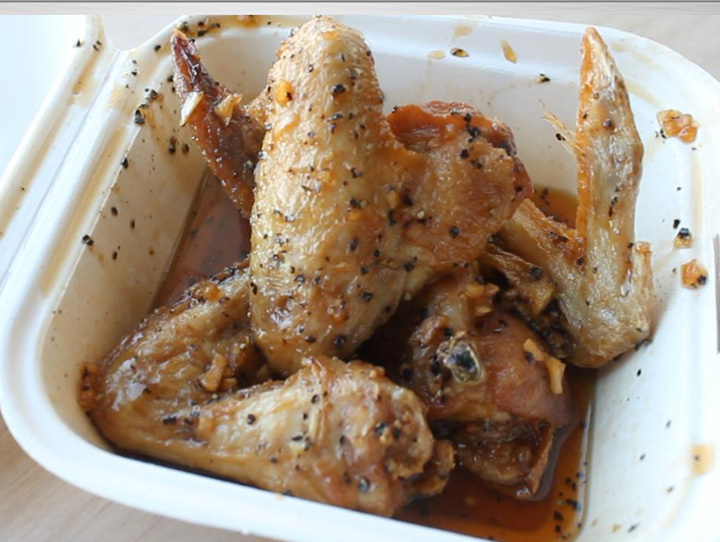 So here is my Cheap$kate Dining video review, which is at the end of this post. 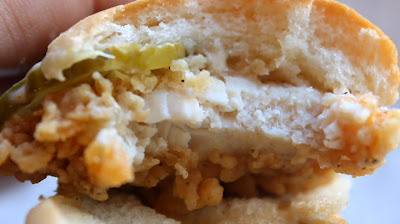 The Chicken Littles sandwich is made using KFC's Extra Crispy recipe, not their Original one (which I prefer,) and the fillet is white breast meat. The coating is well seasoned, although, like all fast food, on the over-salted side. 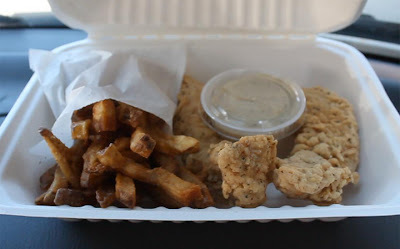 While the chicken tender is not fresh fried, the white meat is still moist and tender. Like a striped down classic car in primer, there is no fancy pinstriping -- the presentation is simple: just a small hot dog-like dinner roll with a bit of mayo and a couple of pickle slices for a buck twenty-nine, plus tax. That's it. If you have enjoyed KFC's Snackers sandwich (I made a PSA comedy video featuring one, here,) this is for you. Chicken Littles use plain tasting mayo, while Snackers had a spicier black pepper mayo, plus shredded lettuce. 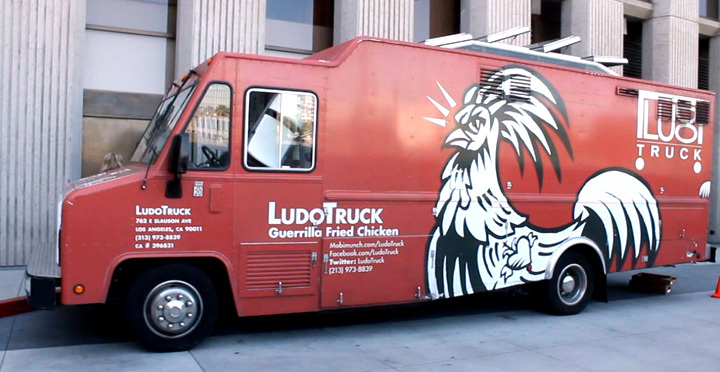 For a tasty bite when you're on the go, I can recommend this sandwich. To see my Cheap$kate Dining rating of 1 to 9, 9 being best, just play the video below. Play it here, video runs 1 minutes, 29 seconds. 99 thanks to Bob McGuinness for his camerawork. After my extended Taco Month Series, I have a lot of leftover tortillas. Corn tortillas usually come in 30 count packages, and I almost never finish a package. Sometimes I just freeze what I don't use. The problem comes when the corn tortillas are defrosted. Some start to break apart and are unusable for tacos. 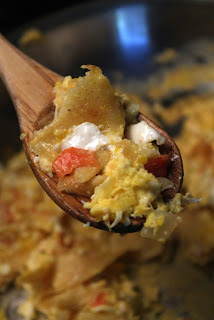 Well, here is a recipe that takes care of the tortilla problem: a scrumptious Tex-Mex scrambled eggs dish called Migas. All you do is crisp up a broken down corn torillla and shred it into your favorite egg scramble. 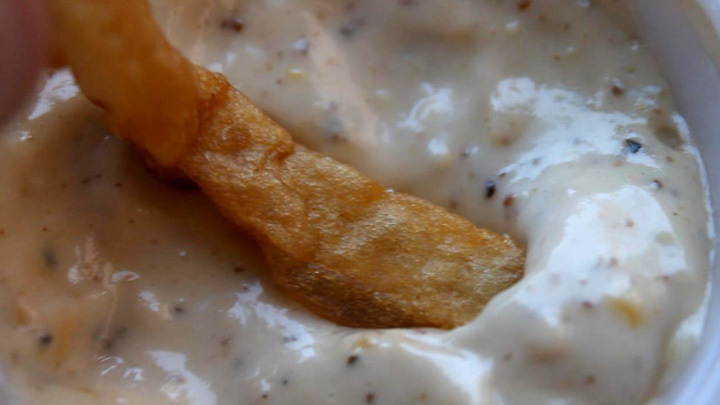 This adds an extra bit of delicious heft to your typical breakfast. 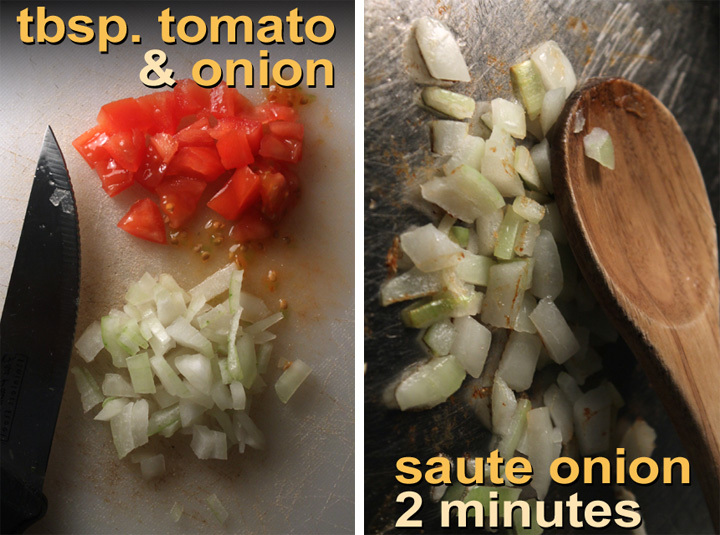 If you have a little tomato, bell pepper, cheese, salsa and onion, that you need to use up, then definitely throw it all into the mix. So don't waste those broken down corn tortillas, just freeze them and bring them out for The 99 Cent Chef's Tex-Mex Migas. 2-3 eggs - for an egg scramble, your way. Okay to blend in milk, cheese or anything you like for scrambled eggs. 1 corn tortilla - sauteed in oil until crisp, then shred into bite sized pieces. You can also just shred an uncooked tortilla and add it to the scrambling eggs. Okay to use leftover plain tortilla chips. 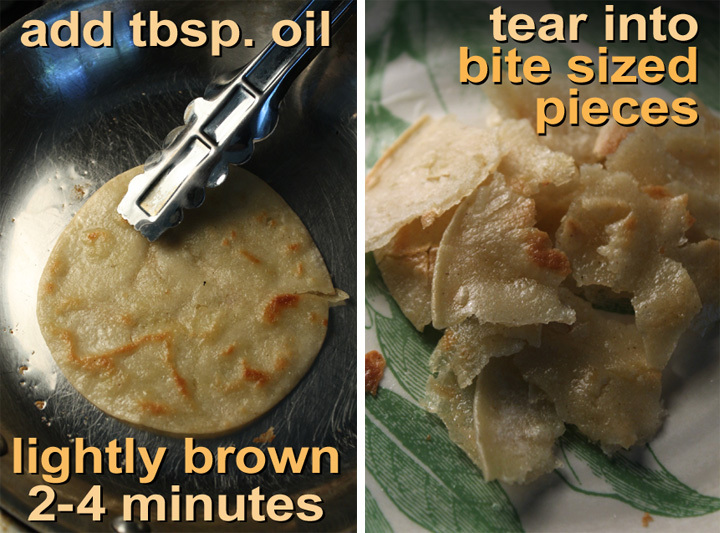 1 tablespoon oil for frying corn tortilla. Additional veggies to add include: bell pepper, garlic, jalapeno chile (just a 1/4 teaspoon) and the herb, cilantro. Add a tablespoon of oil to favorite omelet pan. 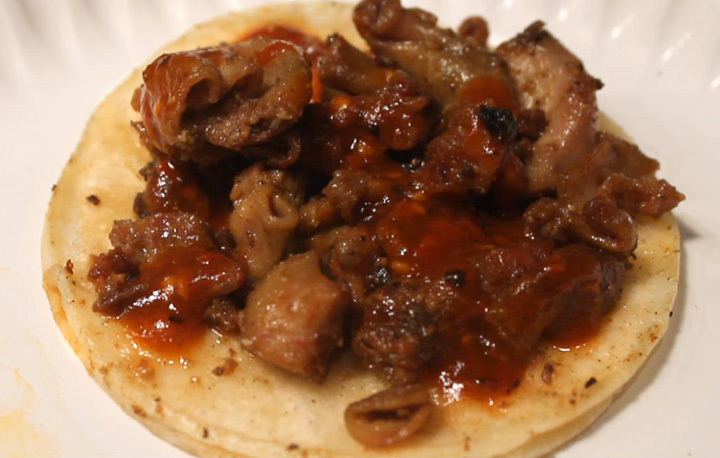 Saute the corn tortilla over medium heat on both sides until stiff and lightly spotted brown. It should only take 2-4 minutes. 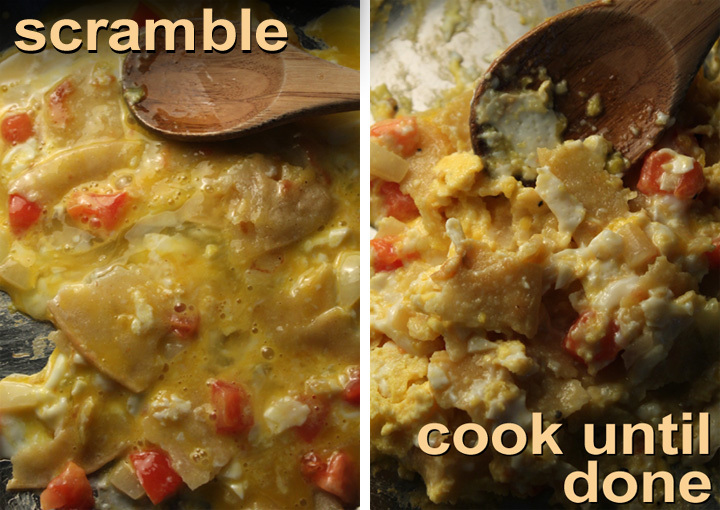 To speed things up, you can add uncooked tortillas to the scrambled eggs as well. 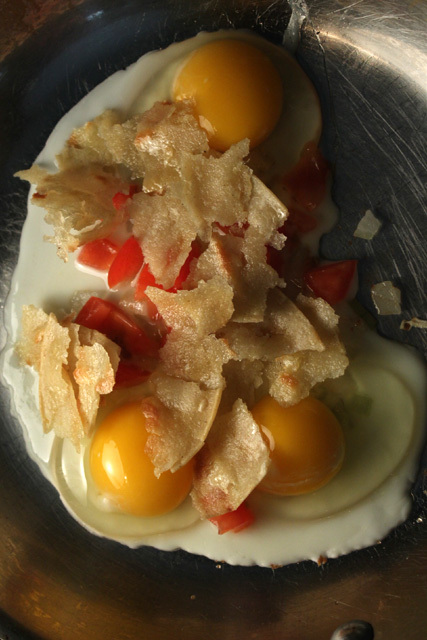 You will lose some of the crisp tortilla texture, but the Migas will still be delish. While tortilla is cooking chop about a tablespoon of tomato and onion. 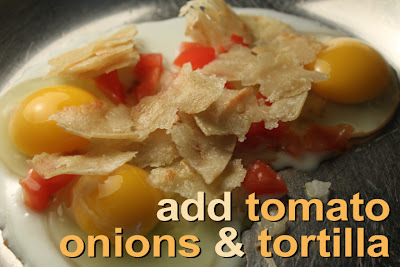 When tortilla is crisp remove and set aside -- when cool enough break into bite-sized pieces. Add chopped onion and saute until soft, about a couple of minutes. Now time to bring it all together. Add chopped tomato, any other optional veggies listed above, plus eggs and tortilla pieces. Scramble egg to desired doneness, about 3-5 minutes. Salt and pepper to taste. Ready to eat when eggs are firm. 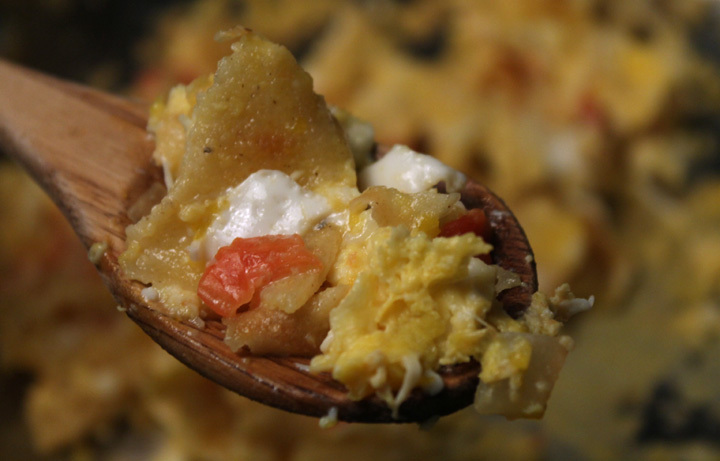 Top Migas with your favorite salsa and hot sauce to kick it up a notch. This is an easy recipe to make for the family, just double or quadruple the ingredients. 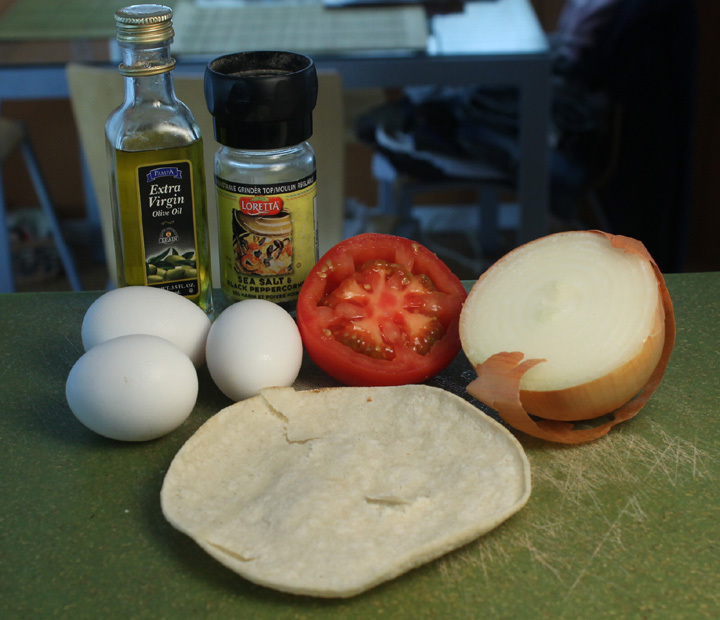 And adjust the tortilla-to-egg ratio to suit your taste; if you like more eggs, then use half the amount of tortilla. Same thing with the veggies, just add enough to taste, and work with the amount you have on hand. There is nothing better than a neighborhood Latin taqueria. I have an excellent one nearby. Last month I reviewed Leo's Taco Truck that rated a perfect 9 on my Cheap$kate Dining scale for their perfectly done Al Pastor Tacos. This month I'll turn you on to a local outdoor taqueria that makes a top notch Buche and Tripas Taco, for only a buck apiece. I'm fortunate to live near Tacos El Primo. This nocturnal noshing oasis is a dining jewel located in an alleyway. Open from about 6pm to midnight, you park on the street and walk up to an outdoor grill with a delicious selection of slow simmering cuts of beef and pork. Under wraps in metal heating trays are Lengua (tongue,) Chicken, Cabaza (skull meat,) and Carne Asada (beef steak). I've been going for the Buche and Tripas $1 Tacos lately, and that's what on my Cheap$kate Dining Video at the end of this post. 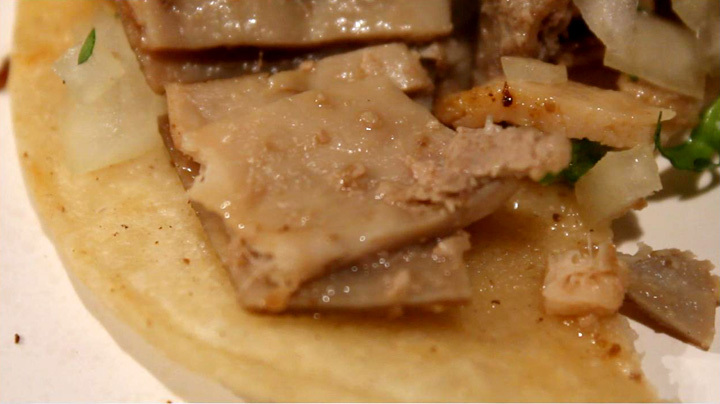 I've had plenty of conventional Carne Asada (beef steak) and Carnitas (pork) Tacos, so it was only a matter of time until I began going to the offal side: Lengua (tongue,) Buche (stomach,) and Tripas (intestine.) Tongue, or Lengua, has the strongest organ meat flavor, but Buche and Tripas are surprisingly mild in comparison -- there is just a slight liver-like flavor to contend with. When I ordered my Tripas Taco, Oscar, who took my dollar, asked "crispy?" 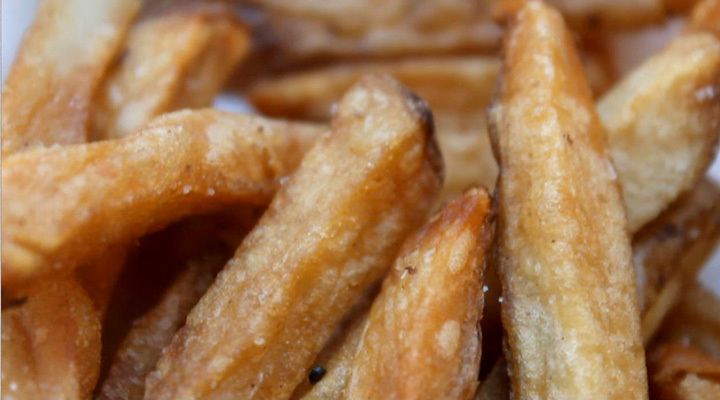 I didn't know you could request crispy Tripas. Well, it's a delicious combination to have crunchy, intensely flavored bits, that are studded on tender cylinders of pliant protein. I also got a Buche Taco. Buche is also chopped, and similar in texture to Thai flat noodles -- very tender and delicate. (It takes hours of cooking to get them pliable enough to eat.) The flavor is very similar to Tripas, with just less chew and crunch. 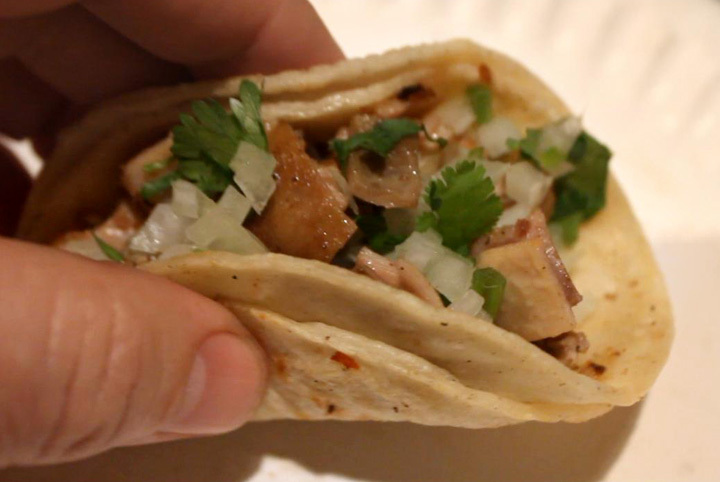 Both tacos by El Primo are deliciously done and score high marks from this Frugal Forager. 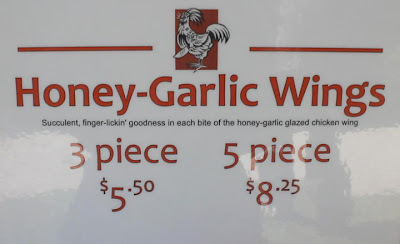 So, to see the Cheap$kate Dining rating of 1 to 9, 9 being best, just watch the video below for an "offally" tasty review. 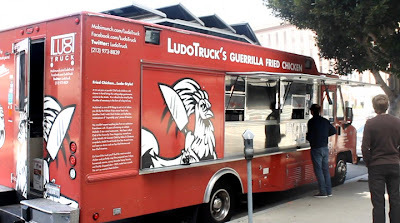 If you are stuck on the 10 freeway between 6pm and midnight, just exit South on La Brea Avenue, turn on the next street, Adams Boulevard, travel West a couple of blocks to Redondo Blouvard, look North and there you will see a taqueria that does street tacos right. And tell them The 99 Cent Chef sent you. Play it here, video runs 3 minutes, 32 seconds. 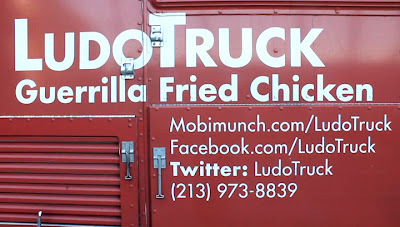 Hours: about 6pm to 11pm, Sunday to Thursday; and 6pm to Midnight, Friday and Saturday. Street parking on Adams or Redondo Blvds. Taco Month is extended into April! 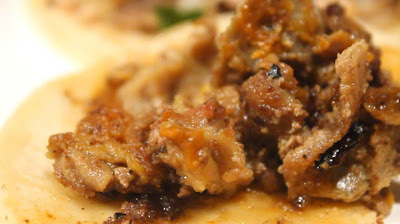 That means another Cheap$kate Dining Taqueria video review and a taco truck recipe favorite, Carne Asada Tacos. Probably the most popular of tacos, Carne Asada has been adapted by American fast food conglomerates into cheaper ground beef tacos. But the American taco pails by comparison. 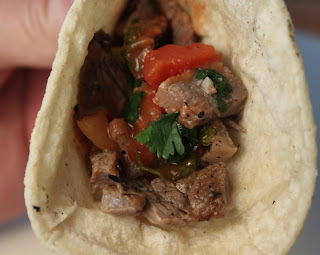 The Mexican version uses more expensive steak for their tacos and the price is usually a dollar to a buck twenty-five at most taco trucks -- a great cheapskate deal. 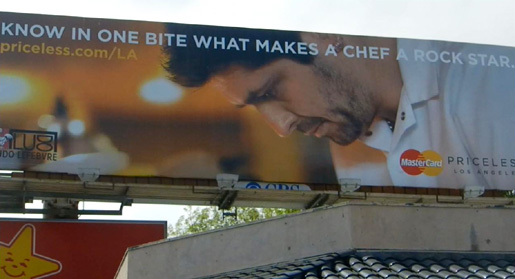 And now the Border Crossing Chef will guide you through the simple steps of making your own. 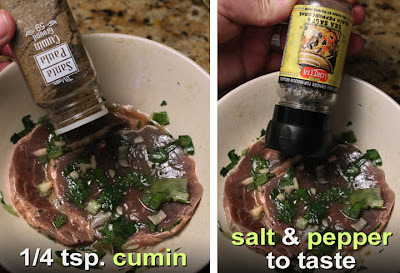 I also include a tasty marinade recipe for the steak. Steak tacos from the Chintzy Chef? 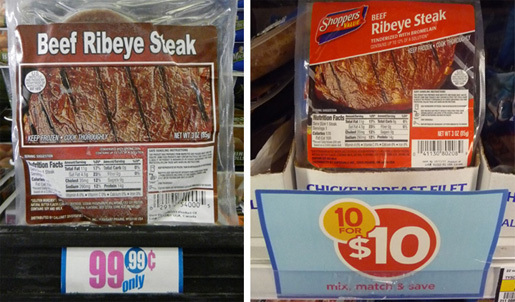 Well it can only happen because I find one dollar three ounce rib-eye steaks at my local market and sometimes in 99c Only Stores. This small, but tasty steak, makes enough for a couple of Carne Asada Tacos. 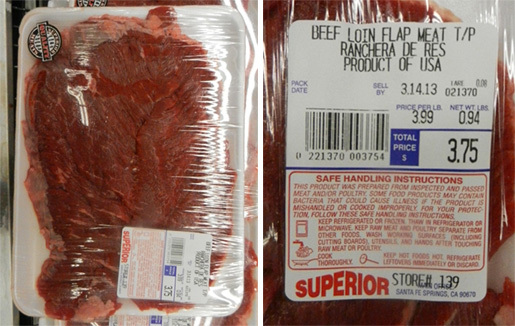 In Latin markets they sell "flap" meat, which is thin sliced and ready to marinate. (In Latin Market meat deli cases they also have steak in the marinade, that's ready for the grill.) 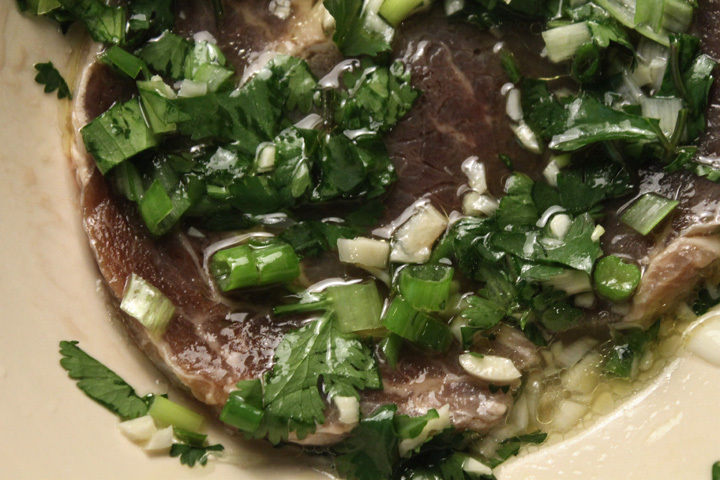 At regular markets you can use skirt or flank steak. A marinade of oil, lime juice, onion, garlic, cumin and cilantro is used to flavor the steak. As for the grilling, I've seen it done a couple of ways. Mainly it's done on a flat top grill (typical stove top) or the best way, over an open flame. Unlike my previous taco recipes from last month, slow cooking Carnitas and fatty Chiccarones (fried pork skin), my version of Carne Asada Tacos are quick to make and easier on the palate. 3 - 5 ounces of steak - I used a $1 thin sliced rib-eye steak. 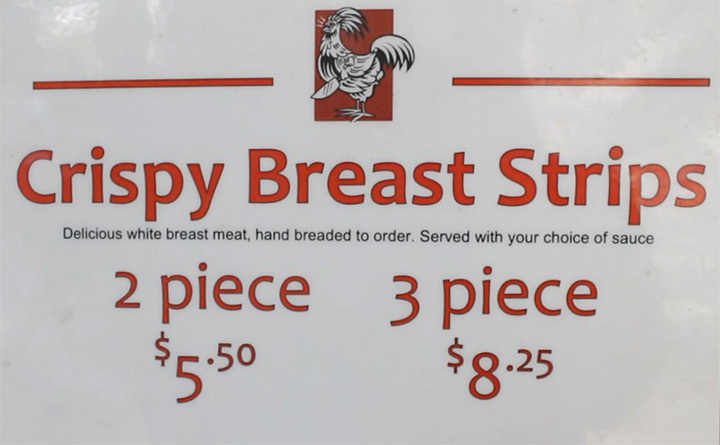 In Latin markets you can use flap meat. 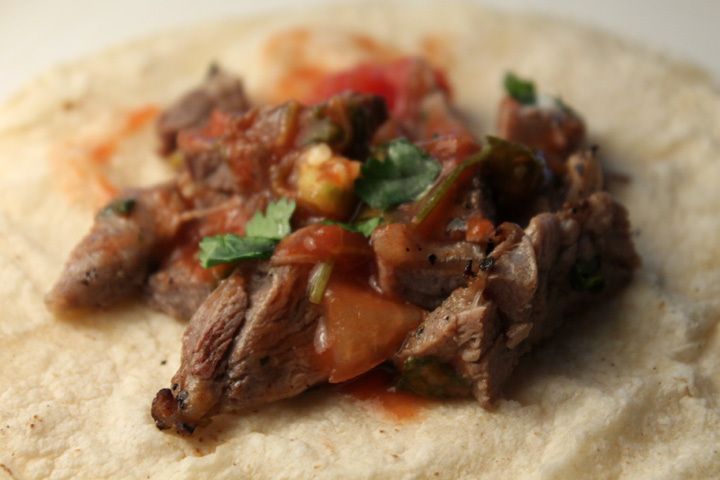 At regular markets Carne Asada is made with thin sliced flank or skirt steak. 1 green onion - roughly chopped. Okay to use a tablespoon of chopped white or yellow onion. 1 teaspoon garlic - chopped fresh or from jar. Juice of 1/2 lime - or use 1 teaspoon from plastic bottle. 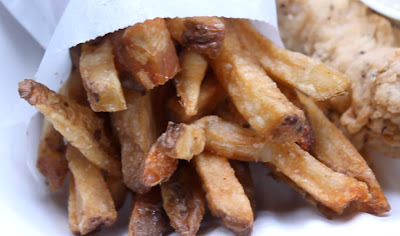 Okay to substitute with lemon juice or white vinegar. Some recipes call for orange juice for a sweeter marinade, okay to add some or just substitute, instead of lime juice. 1 teaspoon olive oil - or a favorite tasty oil. Chop cilantro, garlic and green onion. Add to a wide shallow bowl. 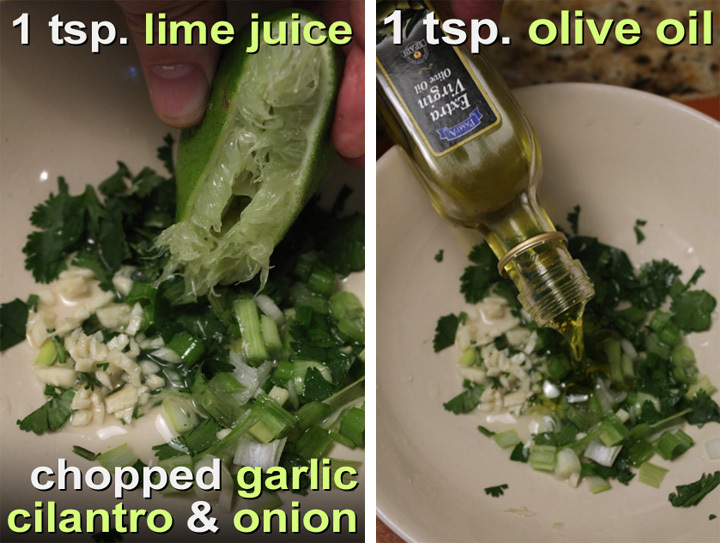 Squeeze in lime juice and pour in olive oil. Season with cumin, salt and pepper. Mix well. Add steak and coat both sides. 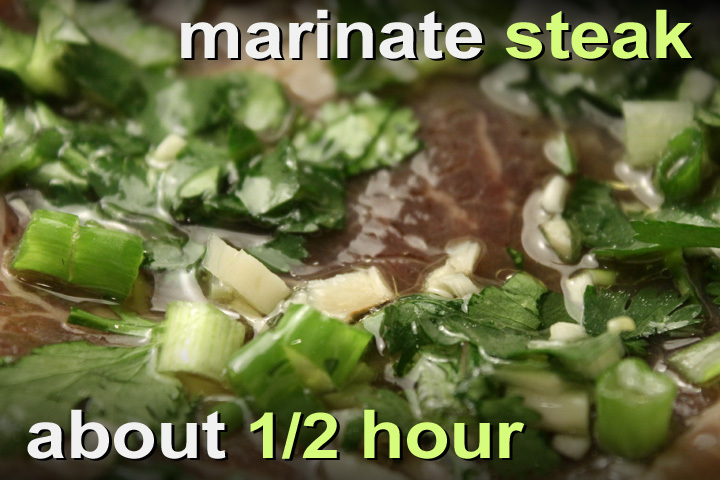 Allow to marinate at least half an hour in the refrigerator. 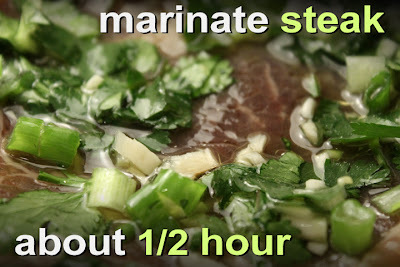 But don't marinate for more than a hour as the acidic citrus juice will start to cook the steak. Before you cook the Carne Asada have all your taco toppings ready to serve. 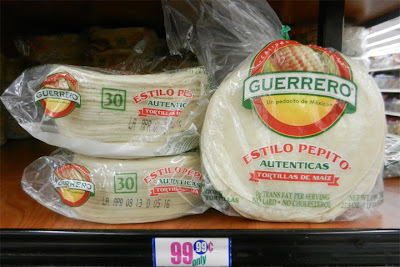 While the meat is cooking you can heat up the corn tortillas for tacos, or flour tortilla for a burrito. Go hear for my homemade Pico de Gallo salsa. 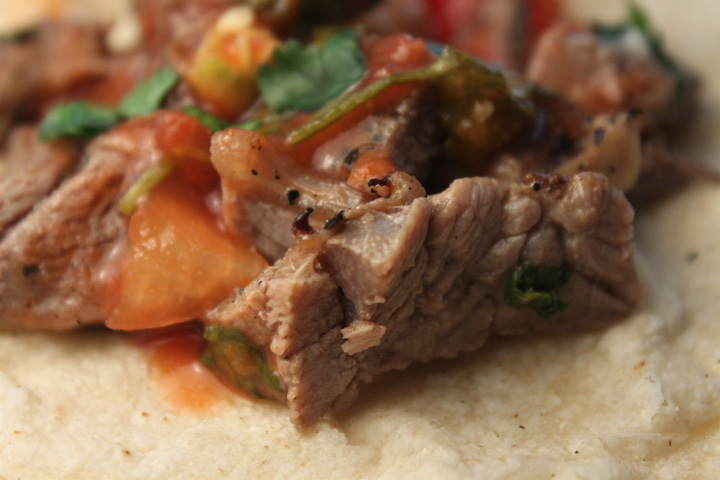 Of course, you can use your favorite jarred salsa. A simple combination of chopped onion, cilantro and a slice of avocado is a great taco topping. Most street taqueras just grill the marinated beef on a flat top grill. So you could just fry up the steak in a hot frying pan. Finally a nice method is to use the oven broiler. You get a good char and it's convenient. Again I would broil one side until well charred then flip the steak and finish cooking it through for a few seconds more. However you cook the Carne Asada, chop it up just before serving. 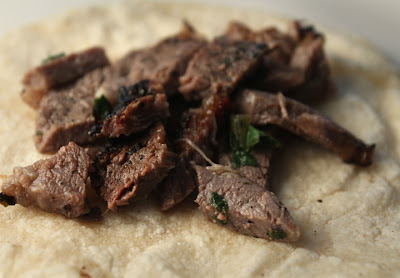 If you want to feed the family Carne Asada Tacos then you will need to get a large piece of steak, like thin sliced flank or skirt. 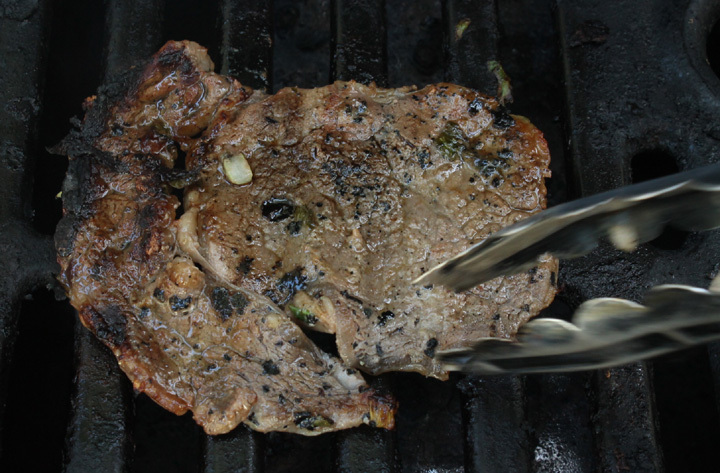 You could use sirloin or tri-tip but will need to slice the large steaks thinner. An easy way is to semi-freeze the pieces for an hour or so in the freezer to firm up the meat to make slicing easier. 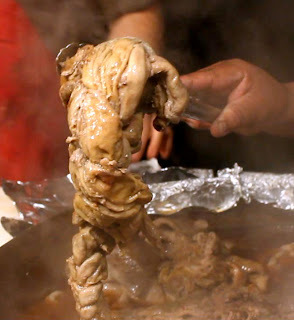 If you are just frying up the steak on your stove top you could chop up the meat into bite-sized pieces first -- that's the way they do it at most taco trucks and taquerias. 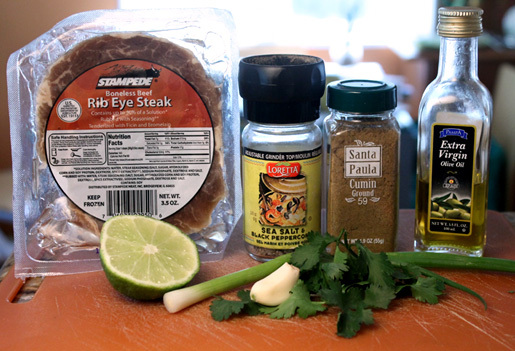 This Carne Asada marinade works well for cheaper chicken and pork. As for the marinade ingredients just increase the amounts: juice of 2-4 limes, 1/2 bunch of cilantro, about 4 whole green onions (or 1/2 white or yellow onion), 1/4 cup of olive oil, 2 tablespoons of garlic, 1 teaspoon ground cumin, and salt and pepper to taste. 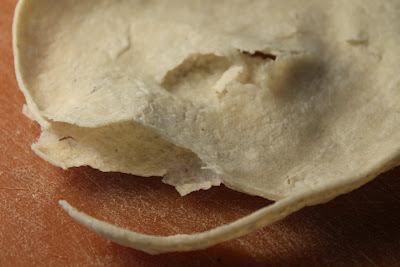 I like to heat my tortillas in another frying pan over a medium heat for a minute on each side until soft and pliable. You could also microwave tortillas for 30 seconds or so.